Where: On any road before you reach the place where another road joins your road from the left or from the right. 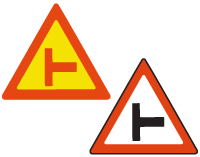 Purpose: To warn that traffic may be approaching you from the left or right-hand side. Action: Slow down so that you will be able to stop, or go around the corner or pass the intersection at a safe speed. Look out for other traffic at the intersection that might not yield.